The 76ers Fieldhouse powered by BPG|SPORTS invites athletes of all ages to come out and experience our 161,000 sq.ft. state-of-the-art sports facility. Get an up close view of our 2,500 person arena with (3) full-sized NBA regulated basketball courts (Home of the Delaware Blue Coats), our indoor turf fields and outdoor turf fields. 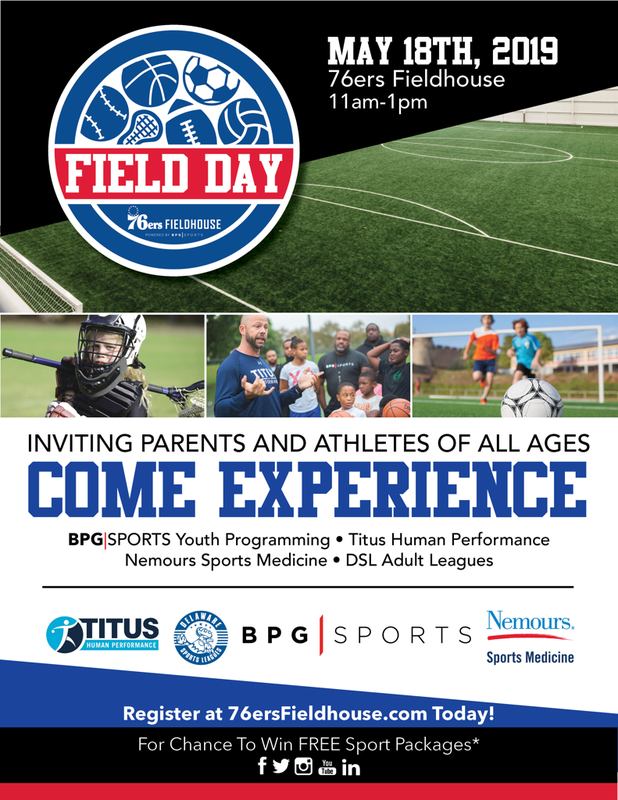 Athletes and parents will have the opportunity to learn about BPG|SPORTS programming, Titus Human Performance, Nemours Sports Medicine and DSL Adult Leagues. All 4 entities teaming up to provide top-tier resources for athletes of all ages and skill levels to take his or her game to the next level. Teaches the methods and exercises necessary to bring out an athlete’s full performance potential and improve the psychological capacity of each athlete. Programming is designed to improve an athlete’s speed, strength, power, agility, endurance and decrease the chance of athletic injury. Come tour and experience their brand new facility at the 76ers Fieldhouse! Our sports medicine team of experts specialize in the care of young athletes-helping them get back in the game and reaching their full potential. Our Adult Sport operator here at the 76ers Fieldhouse. DSL offers basketball, soccer, volleyball as well as flag football leagues you can join as an individual or with friends! Come participate in pick up flag football or soccer and learn how to sign yourself, or a group of friends, up for a DSL adult sport league at the 76ers Fieldhouse! ©2019 76ers Fieldhouse / SportsEngine. All Rights Reserved.